If you think figuring out how to pay for college is overwhelming, you’re not alone. The good news is that Vermont residents may be eligible for more aid than you think. Your state, as well as the greater New England area, are both working to provide you with scholarships and grants to fund your education. Vermont provides publically and privately funded scholarships and grants for state residents, as well as opportunities for high school students looking for a head start on their college education or technical career. How can you apply for these opportunities? Let’s look at the four steps all Vermont residents should take to fund a college education. Your financial aid search starts with the FAFSA, which stands for the Free Application for Federal Student Aid. This application is used to determine your eligibility for different types of federal and state financial aid. We’ll admit, the FAFSA can be a tough form to fill out. Check out our handy guide if you need help with it. Just be sure to complete it though, because the FAFSA has the potential to connect you with various forms of financial aid. After you submit the FAFSA, you can apply for additional state-administered financial aid. Many of Vermont’s scholarships and grants are administered by the Vermont Student Assistance Corporation (VSAC), a public, non-profit agency that informs, advocates, and provides Vermont students with financial aid. VSAC requires that students submit a Unified Scholarship Application (USA) to apply for scholarships and grants. But don’t stress—this form is only three pages long, and, after completing the FAFSA, will take you no time to complete. You can use VSAC’s Student Access Portal to search for and apply for state financial aid opportunities. Vermont State Colleges Endowment, offered by the Vermont State Colleges Foundation (VSC), provides scholarships for students to help cover college expenses outside of tuition, such as books, transportation, and other fees. Vermont Incentive Grant for Vermont residents pursuing an undergraduate degree or certificate at an eligible institution, and demonstrating financial need as determined by the VSAC Grant Program. Vermont Part-Time Grant for Vermont residents enrolled or enrolling as a part-time student at an eligible undergraduate or certificate institution, and demonstrating financial need as determined by the VSAC Grant Program. Vermont Non-Degree Grant for Vermont residents enrolled in a non-degree programwith the intent of furthering their education or improving their ability to enter the workforce. Recipients will be awarded the grant for a maximum of two courses per enrollment term for no more than six enrollment terms. Aid amounts will be decided based upon on individual criteria, and distributed on a first come, first serve, basis. Vermont residents can also apply for Tuition Break, a program administered by the New England Board of Higher Education. Tuition Break is open to all New England residents, and grants students regional tuition costs, rather than out-of-state tuition costs, if enrolling at certain New England institutions. Another good way to locate money for college is to conduct some internet searches of your own. Websites such as CollegeScholarships.com can help connect you to scholarships based on your hometown, level of financial need, and individual characteristics. Visiting the financial aid websites for specific colleges can also inform you of school-specific scholarships and help you zone in the types of aid that are available for you. If you’re still in high school, check in with your guidance counselor about local scholarship and grant opportunities. Your counselor will be able to tell you about current and upcoming aid opportunities in the community. As we mentioned earlier, it’s important to adhere to deadlines, so set reminders in your phone to stay on top of appointments and for when your applications are due. If you are a high school student looking for ways to get an early start on college credits, Vermont State Colleges Foundation (VSC) offers a Dual Enrollment Voucher, for juniors and seniors attending a public high school, technical center, or independent school in Vermont. The voucher covers the cost of one college course at a participating Vermont college or university, and credits can be used toward a high school degree. You can also apply for VSC’s Early College program. This program is an alternative to a high school curriculum, in which students take standard college courses to complete both their senior year of high school and freshman year of college simultaneously. High school students pursuing an education at a technical center can apply for VTC Concurrent Enrollment for similar opportunities at participating technical institutions. You can read about more ways to get a head-start on your post-secondary education here. Depending on your personal situation, you may be looking for further financial aid. Investing in a private loan can be a good way to get the extra funds you need to pay for tuition. 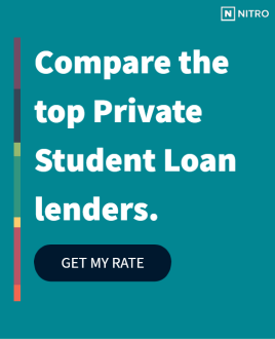 Not all private loans are the same, so you will want to do some research on which of our highly vetted loan providers will be most successful in providing for you. You can check out our free NitroScore tool to help you determine the size of loan that you need. The tool will calculate your total costs to attend college and predict your salary after graduation. To use it, simply enter your intended college and major into the boxes provided. The tool will generate a score to tell you how easy your loans will be to repay based on the projected salary. Feel free to play around with different college/major combinations, and insert information about scholarships and grants. This will help you compare and contrast the best possible scenarios for your future education. Vermont residents shouldn’t be left to pay for college alone. Start searching for your financial aid today.